, 38 mi (61 km) long, SE N.Y., carrying water from the Croton River basin to New York City; built 1837–42. It was one of the earliest modern aqueducts in the United States. ..... Click the link for more information. . The topography of the land influences the design of the aqueduct; usually part of the structure is above ground and part below. Where feasible, an aqueduct may generate hydroelectric power as a byproduct of its operation. Typical of such use is the aqueduct system for Springfield, Mass., which generates power at the foot of Cobble Mt. in addition to supplying the city with water. Aqueducts were employed from early times, probably first in Mesopotamia. Their construction reached a peak of skill in Roman times. Portions of some of the original Roman aqueducts are still standing. An elevated masonry structure with a channel for carrying water that is supported on arches; it was invented by the ancient Romans. a water main (or canal or pipe) for conveying water to population centers and irrigation and hydroelectric installations from sources located at higher altitudes. The term “aqueduct” may also refer to a part of the water main—the bridge over ditches, rivers, and roads. Above-ground aqueducts (with open conduits) and underground aqueducts were built in the ancient East beginning in the second millennium B.C. and in ancient Greece beginning in the seventh century B.C. Some aqueducts of Rome and of the provinces of the Roman Empire have been preserved; the former date from the fourth century B.C. and have a total length of 436 km, 55 km of which are bridge constructions. Arched stone bridge aqueducts with closed conduits 1–1.7 m wide, excellent in design and of majestic architecture, have been preserved; the span of the arches varies between 5.6 m (the Aqua Marcia, Rome; 140 B.C.) and 25 m (the Pont du Gard aqueduct, near Nimes, France; end of the first century B.C. ); they were as high as 49 m and about 300 m long (the now-operating aqueduct near Segovia, Spain, A.D. 109). Medieval installations include the Burgas aqueducts, dating from about the sixth century, near Constantinople, and several later ones in France, Italy, and Spain. In modern irrigation and hydroelectric systems, the bridge parts of the aqueducts (with arch, frame, or girder structures) are made of concrete, reinforced concrete, metal, and more rarely of wood. 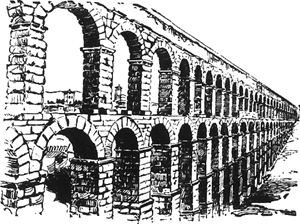 In most aqueducts the walls and the bottom of the conduit (primarily rectangular in cross section) or pipes form the span framework of the bridge. Bulkheads are erected at the juncture of the bridge and the canal; the bulkheads also serve as an antiseepage device. An example of a modern monumental aqueduct is the aqueduct on the Razdan River in Yerevan (1949, architect, R. Israelian; engineer, G. Egiian). Ashby, T. The Aqueducts of Ancient Rome. Oxford, 1935. Grishin, M. M. Gidrotekhnicheskie sooruzheniia, 2nd ed., vol. 2. Moscow, 1955.
a structure for conveying (delivering) water to the place of use. Aqueducts run from rivers, reservoirs, lakes, or other bodies of water. A distinction is made among power-engineering (diversion and turbine feeds) aqueducts, which carry water to hydroelectric power plants; irrigation aqueducts; and water-supply aqueducts. Aqueducts are built in the form of artificial stream beds of closed cross section (underground piping and tunnels) or open cross section (canals and gutters in trenches, on embankments, or on supports such as trestles). Materials used in their construction include steel, reinforced concrete (including prestressed concrete), asbestos cement, and wood. Water may be moved along aqueducts constructed in the form of pipes by the pressure created by dams or pumps (pressure aqueducts) or by gravity flow, taking advantage of varying ground elevations (gravity or gravitational aqueducts). In terms of hydraulics, aqueducts are divided into pressure aqueducts, in which the entire cross section is filled, and free-flowing aqueducts, in which only part of the cross section is filled with water. The basic characteristic of an aqueduct is the fact that its maximum carrying capacity, or water flow rate, is determined by the size of its cross section. An artificial tube or channel for conveying water. A channel for supplying water; often underground, but treated architecturally on high arches when crossing valleys or low ground. When the San Francisquito Dam along the acqueduct burst in 1928, a wall of water and debris 60 feet high hurtling at up to 30 miles an hour wiped out entire communities in California's greatest disaster since the San Francisco earthquake of 1906. Tenders are invited for Special repair to pipe acqueduct on steel truss on ch.